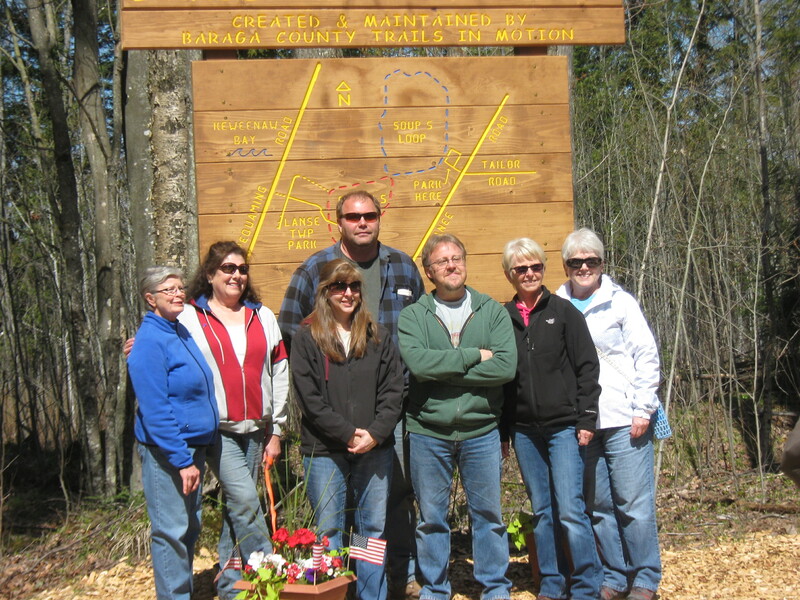 The Baraga County Trails in Motion team. Courtesy of Joe Bouchard. On my snowshoes I stride slowly and deliberately on the hard-packed trail. There is nothing inconvenient or arduous about this outing. Even though I am surrounded by wilderness, I feel safe. I am warm, comfortable and without anxiety. Fresh water, a digital camera, a GPS and a cell phone are part of what I carry in carefully designated pockets. When I need to go back home, it is as easy as hopping into my high-profile vehicle and driving a few feet from the trailhead to the freshly plowed county road. I have time to take in my surroundings. I am not on the clock and no one’s life is dependent on my speed. This is a leisure event for me. Stripped of the hustle and bustle of civilization, my mind freefalls into topics from a simpler time. Consider the simple snowshoe. It has been a travel tool in many cultures for centuries. Traditional snowshoes were rounded, cumbersome, wooden structures that took considerable skill and time to make. Their modern manifestation is a high-tech, light-weight wonder which are available anywhere it snows. I imagine that my aluminum snowshoes are as different from those of a voyager as work boots are to 300 dollar athletic shoes. I know that it is not a profound revelation that technology marches on. Still, it occurs to me that some tools which our forbears needed to survive have become things that we now use for hobbies. What do people today have in common with frontier folk in our family trees? I have often pondered the differences between myself and my Grandfather, the first United States born member of my French Canadian line. How well would I have survived in his world with my current skills and habits? My grandfather was Elmer J. Bouchard. He was born in 1904 in Chaffee, Douglas County, Wisconsin to Jarry Bouchard and Amanda Olivia Johnson. Census records show that he worked as a farmer and as a taxi driver. He lived in such locations in Wisconsin as Superior and Chaffee. Elmer J. Bouchard was a descendant of the 17th century Bouchards immigrants of LaRochelle, France through the Michael and Clement line. Though Elmer may have never set foot in Michigan, he had a connection to Michigan through his father. Jarry Bouchard worked for a time in the Saginaw Valley as a logger in the latter part of the 19th century before homesteading in northwestern Wisconsin at the Chaffee Settlement. 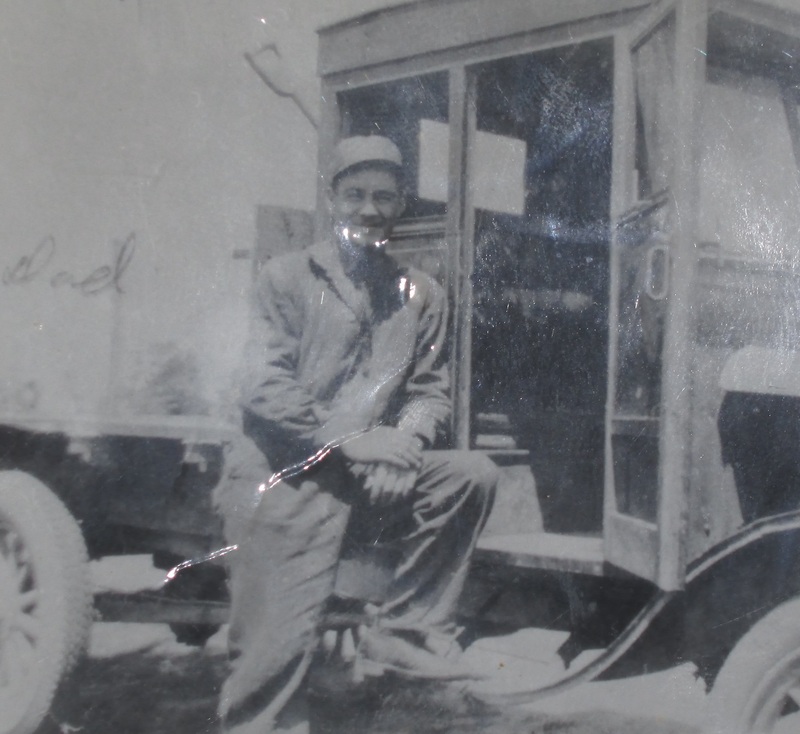 Like Jarry, Elmer’s son (Elmer Jerry Bouchard) would also go to Michigan in search of work. Elmer Jerry Bouchard, born in 1934 in Douglas County, Wisconsin, settled in Detroit in 1954. He remained in that area for fifty-four years before retiring to the eastern Upper Peninsula of Michigan. Elmer J. Bouchard had a short life, barely living into his thirties. He died in an automobile accident on Highway 53 in 1935, leaving behind a wife and six children. Winter driving conditions contributed to his death. I imagine that snow removal and ice control in the 1930’s was vastly different from today’s process. I wonder what someone from eighty years ago would think of the magic performed by today’s huge trucks laden with salt and sturdy plow blades. From the tragic story of my Grandfather’s death, I learned a fact that I would revisit again one day. This was related to me by my Aunt Barbara Bouchard, the official family genealogist. She told me that Elmer J. Bouchard and his neighbor would routinely drive from the neighbor’s farm to Patzau for supplies for their families. Upon return, Elmer would walk around a mile to his home with the groceries. In the winter, Elmer would have to don his snowshoes and his backpack full of groceries and tramp through the woods and snow-covered fields of Chaffee to his farm. I imagine him on wooden snowshoes, bent under the weight of his pack, moving slowly and surely to his destination. The shape of the shoes were likely rounder that the squared ovals of today, forcing him to locomote in a bandy-legged manner. The image of him on snowshoes lay untouched in my mind for a decade or so. After all, as a resident of Detroit, I had little exposure to snowshoeing as a sport or avocation. Then, a mix of genealogy and the weather in the Upper Midwest brought that image to the fore. A view of Lake Superior from the trail. Courtesy of Joe Bouchard. I moved from Detroit to Upper Michigan in the early 1990’s. Like many of my forebears, I moved to take advantage of a work opportunity. Around the same time, through the Escanaba, Michigan LDS library, I made a breakthrough on the French Canadian line of my family tree. I had known about My Grandfather Elmer and his father Jarry at that time. But this trip to the LDS allowed me to pull a keystone of information through the Loiselle Marriage Index on microfilm. I struck genealogical gold and surmounted the dead-end on the pedigree. I remind the reader that this occurred before the rise of the internet. In the meantime, through immersion, I received a thorough education in upper Midwest weather. The weather in my new home town was more like Superior, Wisconsin than Detroit, Michigan. To keep fit during the long winter, I learned how to move in snowshoes. During many snowshoe hikes, I thought about the new family tree information. Images of my grandfather on snowshoes became more frequent. I also thought of fur trappers on their shoes moving through the region decades and centuries ago. In the woods on my snowshoes, I am able to step back in time and temporarily expunge the stresses of modern living. As I hike the trails in the Upper Peninsula of Michigan, I can actually hear the snow fall as I am surrounded by a snow-covered forest-scape. The peace and natural beauty is so different from my birthplace in Detroit. Even though I have lived north of the 45th parallel for over 20 years now, I am still in awe of the simple yet pervasive beauty of the North Woods. It is like seeing a soaring eagle. While I have ample opportunity to do so in this location, the thrill is still there. Since 2010, I have been a part of a local trails group called Baraga County Trails in Motion (BCTiM). Our group promotes the local natural beauty by sponsoring hiking events on trails we created and continually maintain. 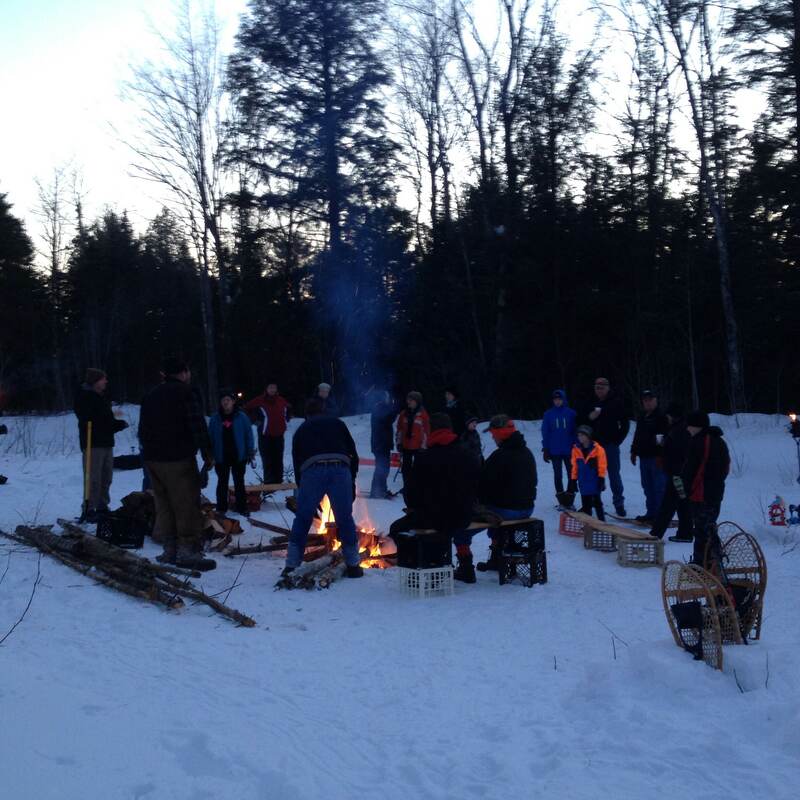 We are an all-season trails group, though my personal focus is on snowshoeing. Locals and tourists are able to step off the highway and into history for a little while. There, they can get a nice workout, reconnect with their thoughts and decompress in beautiful surroundings. 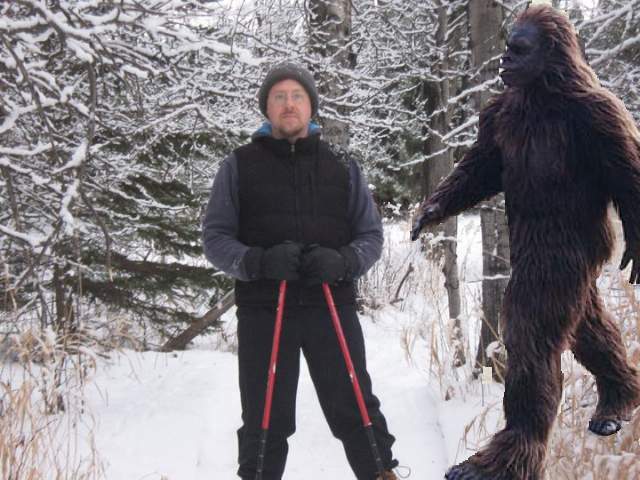 Joe vs. Bigfoot on the popular “Snowshoeing with Sasquatch” trail event. Courtesy Joe Bouchard. Snowshoeing with Sasquatch. Courtesy of Joe Bouchard. 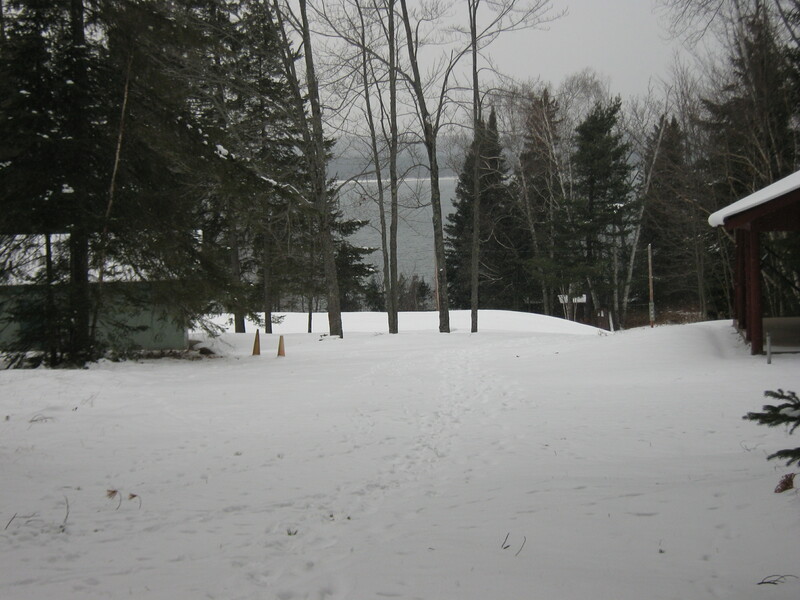 In the past few years, BCTiM has built two trails on the L’Anse Township Park acreage. The trails form a rough figure 8 and take the hiker through a variety of scenery, culminating with a stunning view of Lake Superior. Two popular trail events that BCTiM offers to the community are “Haunted Hike” in October and “Snowshoeing with Sasquatch” in late winter. Future BCTiM plans include linking the L’Anse and Baraga communities through non-motorized trails. I never met my Grandfather because he died some thirty years before I was born. In fact, my father was around one year old when Elmer the elder passed. There were very few stories about this hardworking family man. I tried to piece together his life. As I walk on my snowshoes for the sake of leisure, I wonder what Grandpa Bouchard would think of all of this.